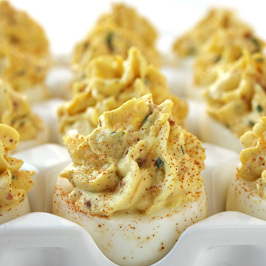 Be the life of the holiday party by bringing these decadent Crab Stuffed Deviled Eggs via Incredible Egg. SLICE eggs lengthwise in half. REMOVE yolks; place in a medium bowl. ADD crabmeat, mayonnaise, 2 tablespoons chopped fresh dill, lemon pepper, mustard and horseradish. MIX until blended. DIVIDE yolk mixture evenly between egg whites. SPRINKLE top of each filled egg white with additional fresh dill before serving. To hard-cook eggs: PLACE eggs in saucepan large enough to hold them in single layer. ADD cold water to cover eggs by 1 inch. HEAT over high heat just to boiling. REMOVE from burner. COVER pan. LET EGGS STAND in hot water about 15 minutes for large eggs (12 minutes for medium eggs; 18 minutes for extra-large) COOL completely under cold running water and peel. 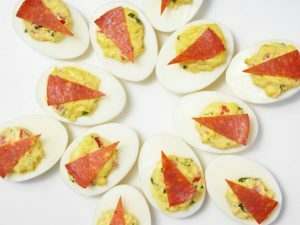 Slices of pepperoni top deviled eggs for a fun, kid-friendly appetizer. The classic yolk mixture gets an Italian update with shredded mozzarella and fresh basil. Place 12 large eggs in a wide pot; cover with cold water by 1 inch. Bring to a boil. Reduce the heat to medium low; simmer 10 minutes. Drain the eggs and run under cold water. Peel and halve each egg lengthwise. Scoop out the yolks. Mash the yolks with 1/3 cup mayonnaise and shredded mozzarella, ¼ cup diced tomatoes and 2 tablespoons of chopped basil. Spoon into the egg whites; top with sliced pepperoni. 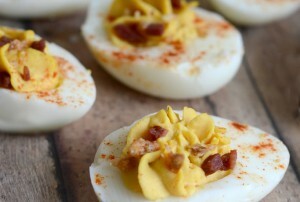 The salty bacon with the creamy egg & avocado make these absolutely delicious. 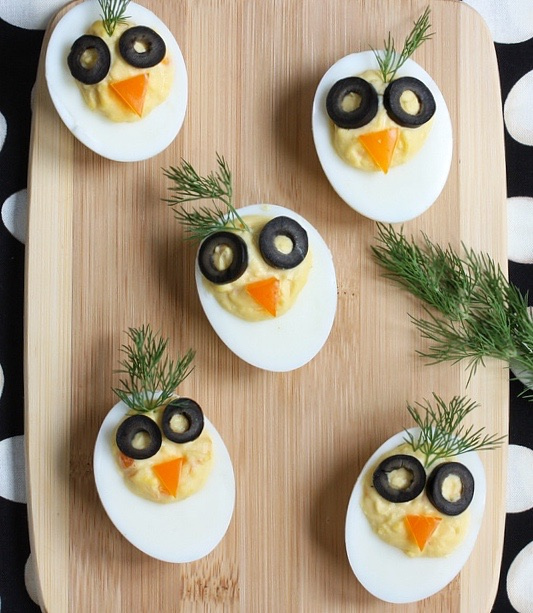 Cut hard boiled eggs in half lengthwise. Remove yolks and place in small mixing bowl. Cook bacon until crispy, chopped into small dice. Remove seeds and inside membranes from tomato and chop into small dice. Add avocado to egg yolks and thoroughly combine (I used a fork). Gently stir tomato and bacon into egg/avocado mixture. Reserve a little tomato & bacon for garnish. Using a teaspoon, carefully fill the egg whites up with egg mixture. Garnish with extra bacon & tomato. Serve over a bed of shredded lettuce. Cook the butternut squash. Prick the squash with a fork several times. You can roast the whole pricked squash at 375°F for about 30 minutes, until tender. Alternatively, you can microwave it for 5 minutes, cut it in half lengthwise, and microwave both halves cut-side down for another 5-8 minutes, until tender. When the squash is tender, remove and discard (or save) the seeds and scoop out the filling. Place the cooked squash in a food processor or blender and blend until smooth. Measure out 6 tablespoons of squash for the deviled eggs. Meanwhile, hard-boil the eggs. Place the eggs in a large pot and cover with at least 2 inches of cold water (*see note). Bring the water to a rolling boil over medium-high heat. Remove the pot from the heat and cover for 11 minutes. Remove the eggs from the pot and run them under cold water to stop the cooking. When they're cool enough to handle, peel the eggs, slice them in half lengthwise and scoop out the yolks into a mixing bowl. Add the 6 tablespoons of butternut squash purée to the bowl with the yolks, and mix. Add the mayonnaise, cayenne, salt, and nutmeg and mix until smooth (you can also return this mixture to the food processor or blender if you want it super smooth). Divide the filling among the egg halves (either using a spoon or pipe it in using a piping bag). Top with a few crumbles of cooked bacon and sprinkle cayenne on top. Refrigerate until serving. Cut eggs in half lengthwise. Remove yolks; set whites aside. In a bowl, mash the yolks. Add the crab, mayonnaise, onion, celery, green pepper, mustard, parsley, salt, pepper, hot pepper sauce and Worcestershire sauce; mix well. Pipe or spoon into egg whites. Sprinkle with additional parsley. Refrigerate until serving. CUT eggs lengthwise in half. REMOVE yolks to medium bowl. RESERVE 20 white halves. Finely chop remaining 4 white halves. MASH yolks with fork. ADD finely chopped whites, mayonnaise, sour cream, mustard, lemon juice, salt and pepper; mix well. ADD dill; mix well. Cover and refrigerate. DYING EGG WHITES: ARRANGE egg whites in glass jars or tall glasses. For each color, COMBINE 1 cup hot water, 1 tablespoon white vinegar and desired food coloring. Maroon: 200 drops (2 tsp.) red + 5 drops yellow + 2 drops black, let sit 5 to 10 minutes. Blue/Dark Blue: 150 drops (1-1/2 tsp.) neon blue + 70 drops (1/2 tsp + 20 drops) neon purple, let sit 2 to 3 minutes for brighter blue and 5 to 6 minutes for darker blue. POUR color mixture over egg whites to completely cover. Let stand 2 to 10 minutes to achieve desired color. REMOVE colorful egg whites from dye mixture with slotted spoon, pat dry with paper towels. SPOON 1 heaping Tbsp. yolk mixture into each reserved egg white half. 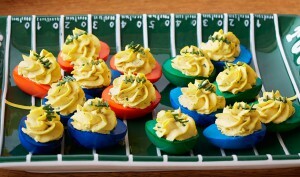 Garnish football eggs with chive laces or other toppers, as desired. REFRIGERATE until serving. Tailgate tip: Prepare filling in plastic bag, as above. Carry whites and yolk mixture separately in cooler. Fill eggs on the spot, pressing filling out of snipped corner of bag. 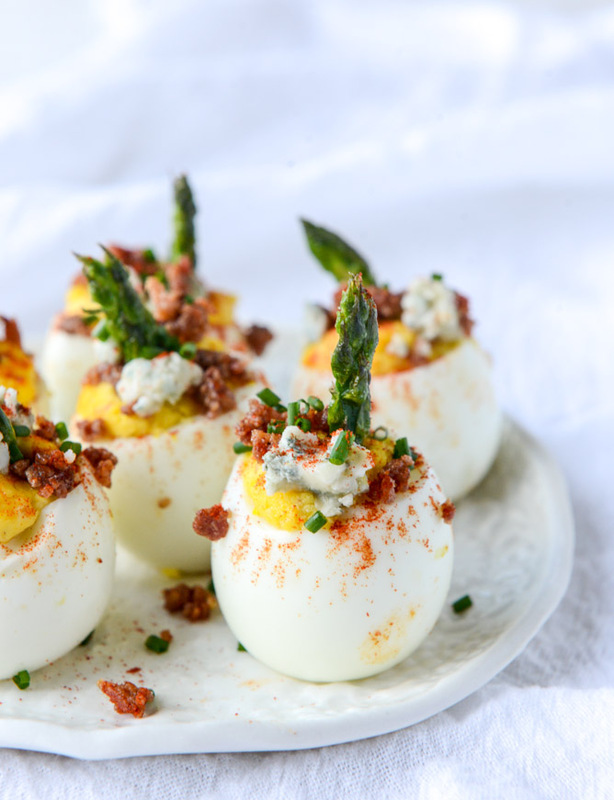 If you’ve been tasked with bringing deviled eggs to a 4th of July get-together, spice up your recipe with these barbecue deviled eggs. Place eggs in a single layer in a large saucepan; add water to a depth of 3 inches. Bring to a boil; cover, remove from heat, and let stand 15 minutes. Drain and fill pan with cold water and ice. Tap each egg firmly on the counter until cracks form all over the shell. Peel under cold running water. Cut eggs in half lengthwise, and carefully remove yolks. Mash yolks with mayonnaise. Stir in pork and next 4 ingredients; blend well. Spoon yolk mixture evenly into egg white halves. Garnish, if desired. *If you want to omit the chopped pork, add a drop of liquid smoke to provide a barbecue-like flavor. 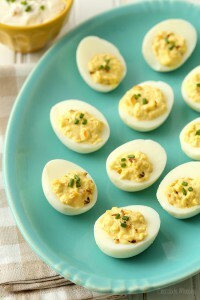 Kick up your classic deviled eggs a notch with these creamy French Onion Dip Deviled Eggs. Packed full of caramelized onion, this party food will disappear in no time. Place the eggs in a large saucepan and cover with an inch or two of water. Bring to water to a full rolling boil over high heat. Turn off the heat and keep the pan on the hot burner. Cover and let sit for 10 minutes. Remove the eggs from the pan and run under cold water. Cool to room temperature then peel. Meanwhile, add the oil to a large skillet over medium-high heat. Once hot, add the onion. Cook for 15-20 minutes or until brown and caramelized. Cut the eggs in half and place the egg yolks in a large bowl. Add the sour cream, mayonnaise, lemon juice, garlic powder, salt, and Worcestershire sauce. Beat until smooth. Stir in the onion. 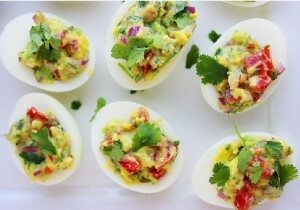 Fill each egg half with filling. Top with chives. Store in an airtight container in the refrigerator for up to 3 days. 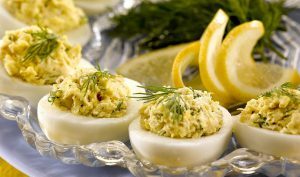 Peel the hard boiled eggs and cut eggs in half lengthwise. Add two of the egg yolks to a medium bowl; discard the remaining yolks. Add avocado and mash with a fork or potato masher. Gently stir in lime juice, red onion, tomato, cilantro, salt and pepper. Adjust seasonings to taste. 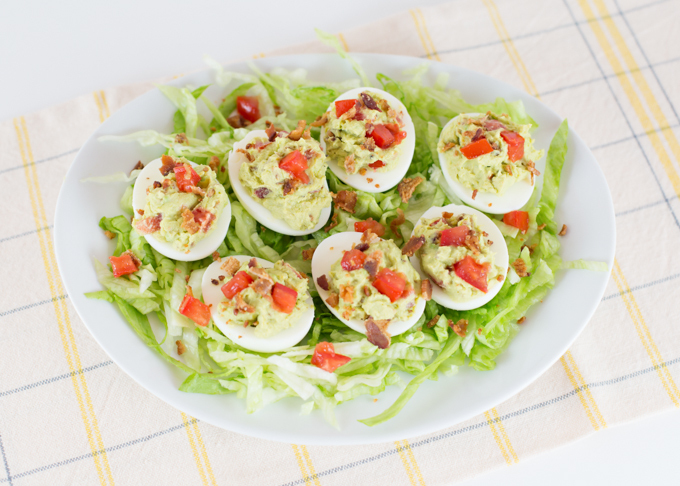 Place egg halves on a platter and scoop guacamole evenly into each halve. Sprinkle with a little additional chopped cilantro and serve. 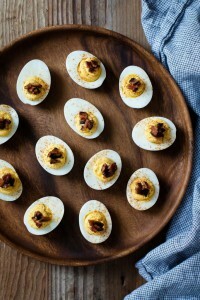 Never have you ever had deviled eggs like this before. Preheat the oven to 350 degrees F. Slice the top off the heads of garlic and drizzle them with olive oil. Wrap them tightly in aluminum foil and place it in the oven to roast for 45 to 60 minutes. You want the cloves to be caramely and golden. Remove the garlic and unwrap it, allowing it to cool until you can touch it. You can do this a day or two ahead of time if you'd like! After 30 minutes, peel the eggs and place them on a paper towel. Slice off a TINY piece of the fat bottom of the egg so it can "stand up." Slice off the upper 1/2 of the egg to reveal the yolk (occasionally you might have to slice off more or less, it just depends). Gently scoop the yolk out of each egg with a small spoon, fork or knife, trying not to destroy the white in the process. This can be difficult, so do it patiently and gently. Add the bacon slices to a food processor and pulse until it is in crumbles. It may stick together and be paste-like, which is fine because it will stick to the eggs better! Remove the bacon and place it in a bowl. Do NOT clean out the food processor! Add the egg yolks, mayo, yogurt, mustard, salt, pepper, and roasted garlic cloves (squeeze them out of the bulb) to the food processor. Add in a drizzle of reserved bacon grease if you have it, like 1 to 2 teaspoons. Blend until smooth and creamy and mousse-like. Scoop out the mixture and spoon it (or pipe it with a pastry bag) into the open egg whites. Top the yolk mixture with a sprinkle of the crumbled bacon, pressing it gently to adhere. Add some blue cheese crumbs. Slice the asparagus in half if needed (you'll need to cut it to get 18 pieces and I recommend doing it AFTER cooking) and stick it down in the eggs. Sprinkle on smoked paprika! Sprinkle on chives! Serve it. Eat it. Done.